The Delaware County Board Elections sat and meticulously went through provisional ballots Friday afternoon. 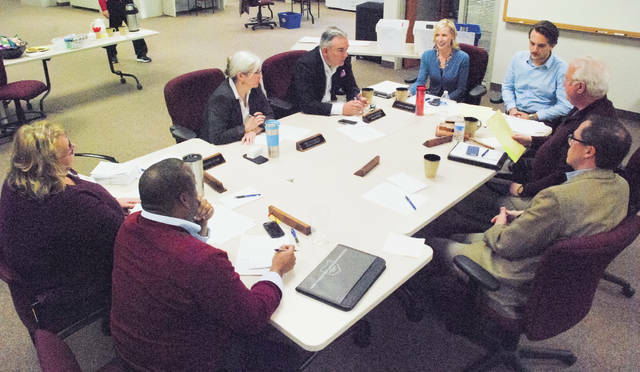 The board was asked by the Franklin County Board of Elections to move its ruling on provisional ballots from Nov. 27 to this past Friday to accommodate the City of Westerville’s charter policy that requires swearing in candidates on Dec.1. In a special session Friday, the Delaware County Board of Elections ruled on the provisional ballots and the remainder of the absentee ballots from the Nov. 7 election. The board will decide on write-in ballots and conduct the official canvass today at 4 p.m. That session is open to the public. The board received a request from the Franklin County Board of Elections and the City of Westerville to move the meeting from Nov. 27 to this past Friday. Westerville’s corporation limits include both Franklin and Delaware counties. Deputy Director Anthony Saadey said according to Westerville’s charter, candidates running for an office in Westerville are to be sworn into office Dec. 1. In order to be compliant with Westerville’s charter, Delaware County’s Board of Elections met to rule on a total of 541 provisional ballots. The Ohio Secretary of State’s office oversees the state’s elections. Board officials said the 541 ballots were absentees that were folded, spindled, with incorrect or missing information that could not be counted the day of the election. In a clarification, board members said some of the ballots were also received late, after election night, but were postmarked correctly. Board members said they were only allowed to use in-office sources to assist in the verification process. In some cases, the official rules governing the process provide no latitude for the board. “It’s tiny little detailed things,” said board member Peg Watkins.